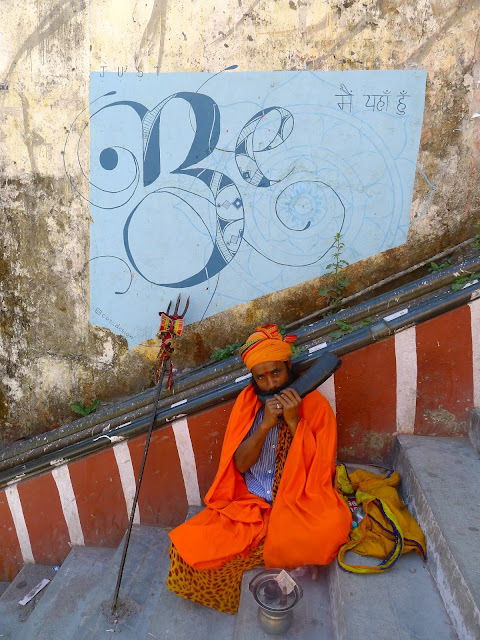 Our final Indian road trip was to Rishikesh, a holy place of ashrams, yoga and meditation. On the banks of the River Ganges in the foothills of the Himalayas. But before we got to Rishikesh, we had a couple of stops to make on the way. Subhash had arranged two visits with his wife's family. Our first stop was with Subhash's wife's aunt and her family. This little guy would not look at us for love nor money. He cried when he peeked through his fingers. "He's never seen a white person," they told us. He probably thought we were ghosts. We posed for many, many photographs. The little boy standing in front of me (green sweater and tan pants) was so cute. It is a Hindu custom to touch the feet of an elder when greeting them. He came into the room where we were sitting and immediately approached us to touch our feet. No visit is complete without food. After these snacks came samosas and sweets. And pots and pots of masala chai, of course. 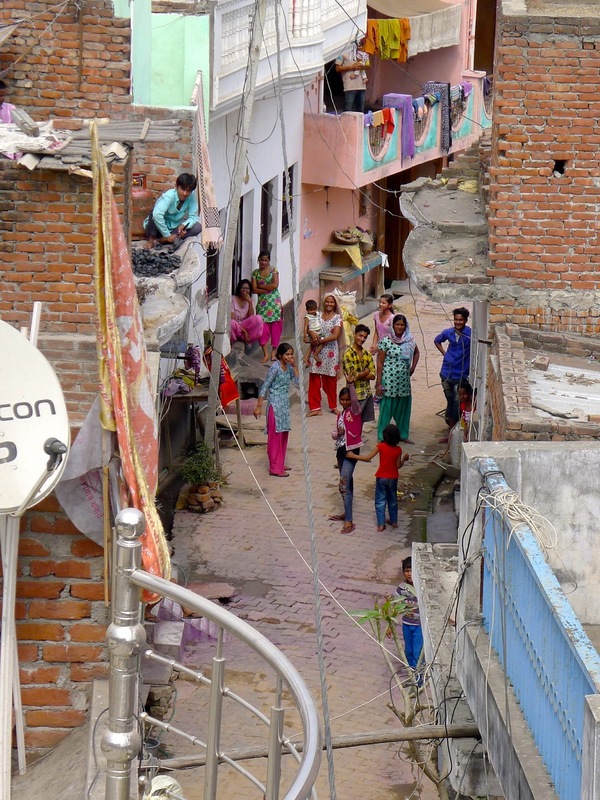 Word travelled fast that foreigners were in the neighbourhood. These guys came down the lane to check us out. Our next stop was to visit Subhash's mother- and sister-in-law. Again there was lots of food, lots of photos, lots of laughter and lots of trying to communicate in our respective languages. Joe and I with Subhash's mother-in-law and sister-in-law. The whole family, plus a few extras thrown in for good measure. Through an open door, I saw the neighbourhood children creeping closer and closer to take a peek at us. I left the house and posed for a photo with them. All doggies love to go for rides. When our visit ended, our entourage personally escorted us out to the street and to our awaiting car. 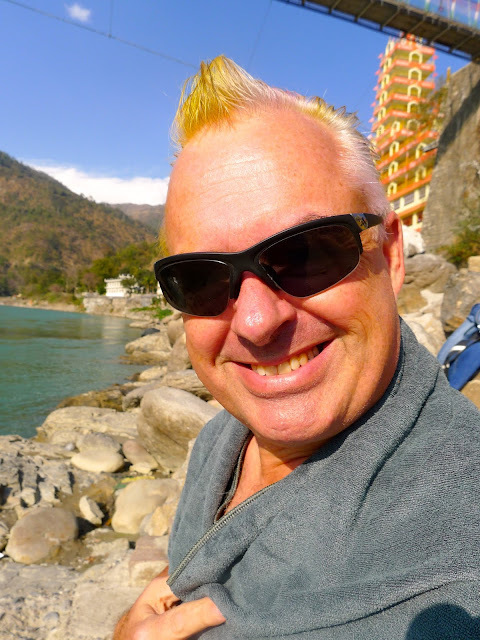 We arrived in Tapovan, on the outskirts of Rishikesh later that afternoon. Early one morning we went for a peaceful walk through the town, over the bridges and along the banks of the Ganges. 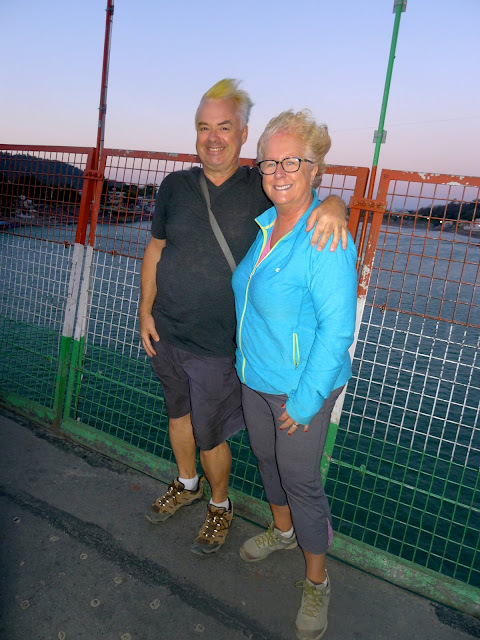 It was a tad windy on the bridge deck that morning! Many people come to Rishikesh for outdoor adventures. We took a drive into the mountains one afternoon to visit the Neelkanth temple. Garlands of marigolds hung from electrical wires. Joe and Subhash lit some incense outside the temple. A busy bridge over the Ganges! I met this fun-loving group of Indians while crossing the bridge one afternoon. 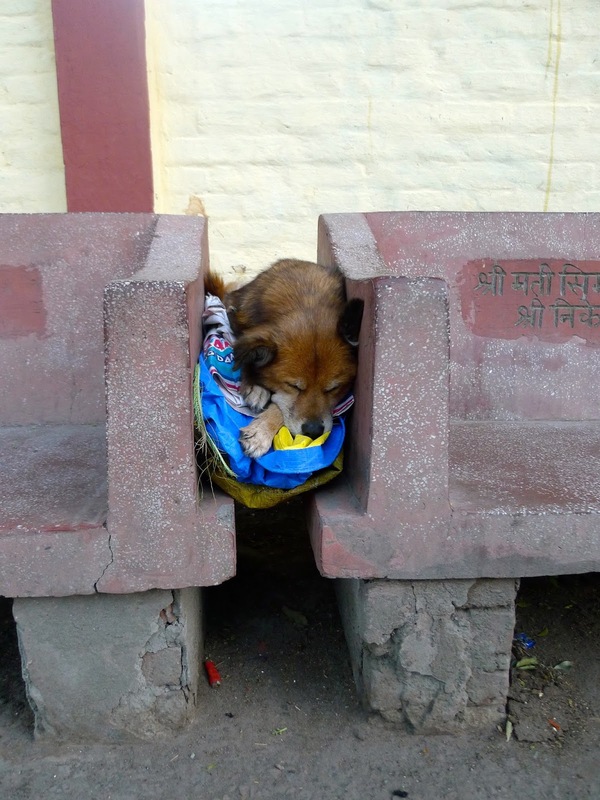 It is not a dog's life in India. One night we went to a popular restaurant in 'downtown' Rishikesh. The streets were very congested with all manner of animals and vehicles. Subhash squeezed his car next to the sidewalk in front of the restaurant. The parking attendant called out, "No parking! No parking! I will call the police!" Joe slipped the man 50 rupees and all of a sudden his demeanor changed. "Please sir, park here!" Joe was pretty proud of his first bribe! Subhash and Joe bathed in the holy waters of the sacred Ganges River. Joe doing his best Tin-Tin impersonation. And now we head back to Delhi for our final two nights in India. We plan to do some last minute shopping and spend more time with Subhash's family before we fly to Thailand. We are looking forward to some rest and relaxation on the beaches of Koh Chang.